Q: I've just recently moved to Florida from North Carolina. I don't know much about tropical plants. Can you perhaps suggest an easy and pretty flowering plant for a beginner which I can plant around my garden pond for a tropical feeling? 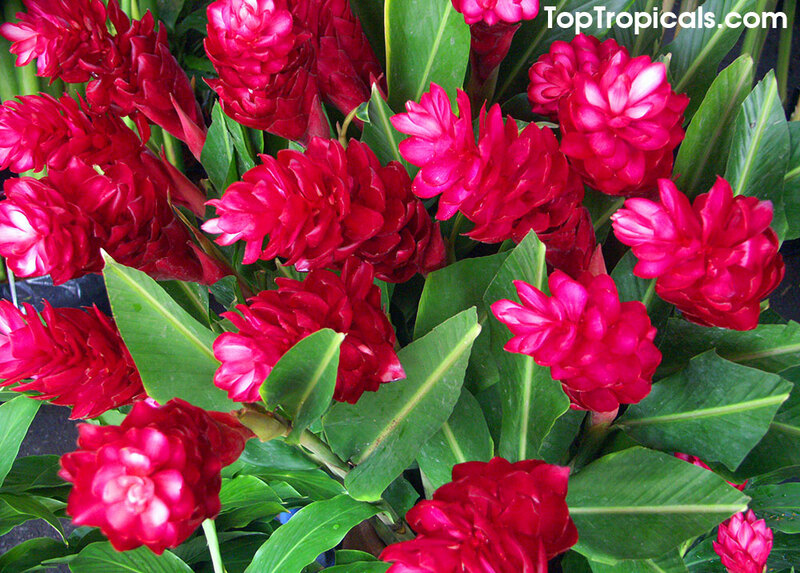 A: For adding that tropical look to your garden, few plants beat beautiful ginger! Alpinia purpurata, the Dwarf Red Cone Ginger with its bright red floral spikes and lush, lance-shaped foliage is no exception. This striking perennial will add a tropical effect to your garden that will definitely take your breath away. The Dwarf Red Cone grows between 3 and 4 feet tall and blooms 8-9 months of the year! The blooms will hold on the plant for up to 3 weeks! It makes a very attractive and distinctive backdrop for other plants. Red Cone Ginger likes partial shade and moist, humid conditions, but will tolerate full sun. It is fast growing, easy to grow and resistant to disease, heat, and insects. The plant is a wonderful accent in a garden and works well as a focal point specimen, show-stopping when planted around garden ponds or near entryways. This ginger also works very well in containers and planters. Either in mass plantings or smaller groups, all gingers add tropical flair which never disappoints. In addition, the beautiful flower spikes make for great, long-lasting cut flowers and is an interesting addition to bouquets. An added bonus? Dwarf Red Ginger is super easy to propagate. If stems are cut at the base and placed in water, they will generally root within a few weeks. Eventually, you can make a whole flowering hedge just from one plant! Who does not like a plant that is non-fussy and not only beautiful but easy to grow? Dwarf Red Ginger is more than just a pretty face! To keep this plant happy and blooming, give it some food: Broad Leaf Plus - Ginger-Heliconia-Banana Booster.